In our little town, it was a tradition for Mother's Day to wear a rose in honor or in memory of your mother. A red rose meant that your mother was still alive; a white rose was worn if your mother had passed away. Every Mother's Day morning, I went off to Sunday School with a red rose pinned to my dress. My own mother would wear a white rose, although I think Daddy sometimes gave her a white corsage instead. I continued this tradition until Mother died in July 2007. That next year, I just didn't have the heart to find a white rose. Ironically, the red rose I used to pick disappeared in the spring of 2008. A guy in my Sunday School class still wears a white rose. He grew up in Atlanta, so I guess they had this tradition in the city, too. But this Mother's Day, I'll think of Mama, who loved yellow roses the best. She had several through the years. Today, Rosa 'Golden Showers' climbs a trellis at her house. I haven't been down there in a couple of weeks, and I imagine the first flush of bloom is probably past, like most of the other roses in Atlanta (until recently, roses were at their peak on Mother's Day). The rose pictured above is the David Austin English rose 'The Pilgrim'. This is from a slide I took several years ago at Brooks Garcia's east Atlanta home. He had the rose growing up through other shrubs and vines along his front walk. I love the lemon yellow color and the very double flowers. If I can figure out this deer thing, I'd love to grow this rose. I'm sure Mother would have loved it. I think it's about as pretty as any yellow rose she ever grew. 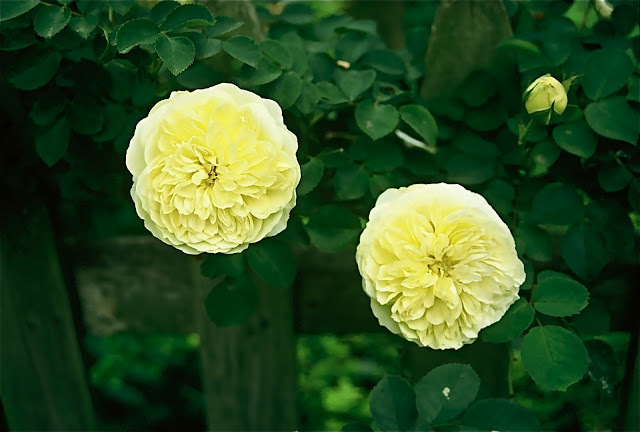 The yellow roses are lovly. I have 40 rose bushes. I really do not like any thing that does not bloom.